If you are in the blogging world, or even on Pinterest, you have by now experienced the ups and downs of having this double life. New friends who seem to love everything you say and do. Seeing beautiful interior and fashion images that spark your imagination. 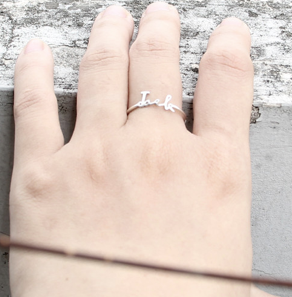 Finding new treasures that you could fit into your wardrobe and lifestyle effortlessly. New friends who condone every dime you think about spending. Seeing all these pretty images make you sad about your current home. Finding amazing new things that you obsess about. Ok...so its true. Both the highs and lows. So here is my latest high and low wrapped in one. 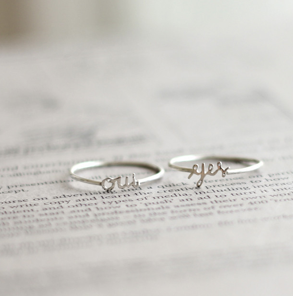 They also come in these adorable 'oui' and 'yes' rings. While the cost is not bad, $35, I have to come to terms that I cannot have every little thing I want. 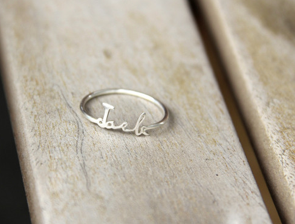 On the other hand, how cute would it be to have a ring with not only my hubbys name but also one for my little Dorothy Mantooth?